Off PA Turnpike exit 91- Donegal (formerly exit 9). Turn right onto route 31 and go approximately 1/4 mile up the hill and turn left onto Hellen School Road. (first left turn after getting onto Rt. 31) Go approximately 1 and a half miles to a 4 way stop. Go straight through 4 way and continue approximately 1 mile to Kessler School Road. 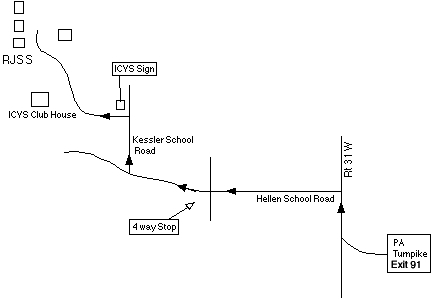 (first right after 4 way) Turn right onto Kessler School Road and go approximately 1/2 mile until you see the signs for ICVSA and RJSS. Turn left onto the club road and go about six tenths of a mile (continuing past the clubhouse and over the hill) until you find the town of River Junction, population 89.